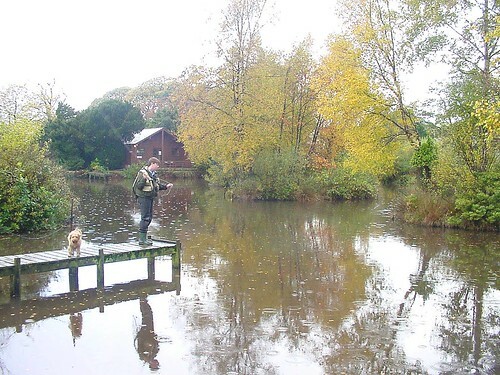 Bank House Lune Valley Fly Fishery and Tackle shop North West England UK. Bank House is full of corixa and sticklebacks so fry patterns and small beaded flies are a must in the box. The browns lie deep, so they can see a large area of the surface. For this reason dries catch more than their fair share of them. Good dries to have are shipman’s, CDC buzzers and sedges. The water is deep close into the islands, so the trout hold in these margins. Buzzers or nymphs fished ultra slow on a floating line is a banker rainbow tactic. In the cold oxygen rich water of March and April the trout will give a great account of themselves. The blue trout are aerobatic and hard fighting and there will be plenty of specimens, so don’t fish too lightly. See if you can catch all four species in one visit. Caught by Anthony Marsh from Preston. Alen Glynn with a cracking Trout !